I tried several times to make Caramel Apples this year and either the caramel didn't set up enough or it got over cooked and hardened too much. But after numerous attempts I finally got it right. As I made the last batch of caramel I thought about how much I love apple cider. I decided to add some cinnamon to the caramel to give it a yummy fall flavor with the apple, and it was heavenly! I highly recommend trying it. After having so much trouble with getting the recipe just right I learned a lesson about candy thermometers. Always test your candy thermometer before each use by bringing water to a boil; the thermometer should read 212°. Adjust your recipe temperature up or down based on your test. In a large heavy saucepan, melt butter; add the brown sugar, corn syrup cinnamon and salt. Cook and stir over medium heat until mixture comes to a boil, about 10-12 minutes. Stir in milk. Cook and stir until a candy thermometer reads 248° (firm-ball stage). Remove from the heat; stir in vanilla. Pour mixture into a deep small bowl, to make dipping the apples easier. Dip each apple into the hot caramel mixture; turn to coat. Place on parchment paper** until set or immediately roll in toppings. Drizzle with melted Chocolate once the caramel has set slightly. * There are all sorts of ideas out there for how to decorate/top your caramel apples. 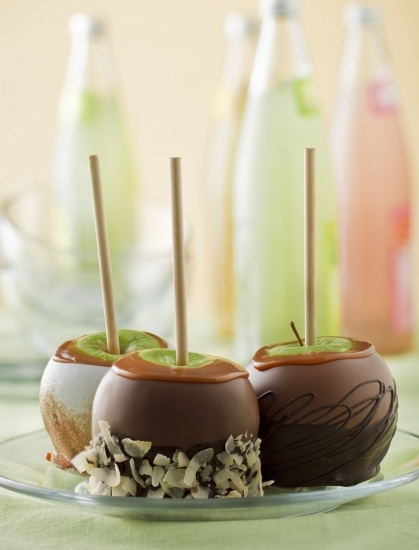 You can melt some chocolate or white chocolate and drizzle it all over your apples. You can dip the base of the apples in chopped nuts or candy. The biggest thing to remember is to make sure everything is set up and ready before you start making the caramel. Once your caramel is done you won't have time to set things up, you will need your apples all prepared and ready to go and the toppings ready to dipped in. ** Only use parchment paper, the caramel will stick to wax paper, and tin foil, but it won't stick to parchment paper. Save yourself the time and worry of the caramel sticking to your paper. To nurture and feed your family physically is as much an honor as to nurture and feed them spiritually. A young mother will build faith and character in the next generation one family prayer at a time, one scripture study session, one book read aloud, one song, one family meal after another. She is involved in a great work.